Fig. 10.3. Appearance of ureteral obstruction related to TCC on excretory urogram matory lesions of the kidney and for the evaluation of renal trauma (Kawashima et al. 1997, 2001). Although less commonly obtained in the urgent evaluation of upper urinary tract obstruction, techniques of CT urography are also increasingly favored as diagnostic tests for evaluating hematuria and urothelial carcinoma (Figs. 10.3 and 10.4) (Kawashima et al. 2004). Fig. 10.4. 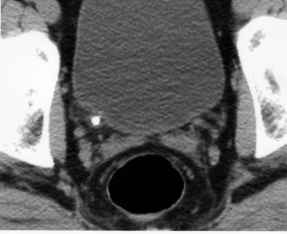 Corresponding appearance of obstructive urothelial carcinoma of the ureter on contrast-enhanced CT urogram patients with indinavir stones and select patients with completely uncalcified matrix stones. The diagnosis of stone disease on noncontrast CT is simplified by the appearance of proximal ureteral dilation, hydronephro-sis, and the possibility of stranding in the perinephric fat (Colistro et al. 2002). 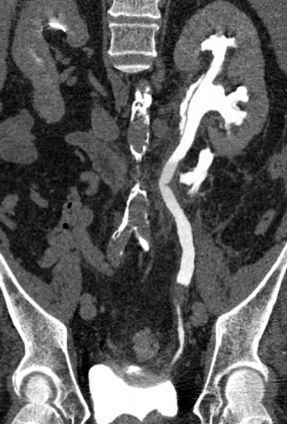 Another secondary sign of acute obstruction recently described by Ozer and associates is the difference in renal parenchyma density on noncontrast CT. In a study of 49 patients with obstructing ureteral stones, a Hounsfield unit (HU) decrease in the ipsilateral kidney was observed in all cases. When a parenchyma decrease of more than 5 HU was observed on the obstructed side, the sensitivity, specificity, positive predictive value, and accuracy of acute obstructing stone on the ipsilateral side were 89.1%, 100%, 100%, and 93.4%, respectively (Ozer et al. 2004). Concurrent findings of pyelonephritis or abscess can also be suggested on noncontrast CT by nephrome-galy and changes in the renal parenchyma. 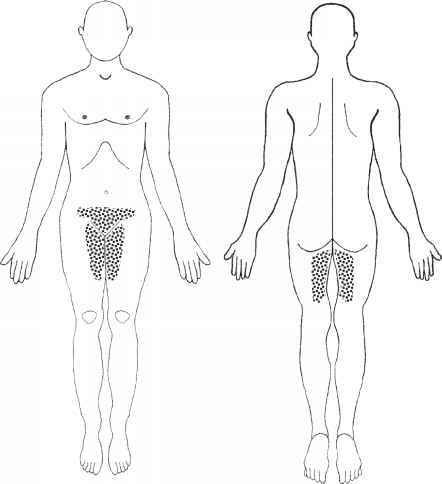 It is especially important to recognize the presence of air in the collecting system or renal parenchyma, as this may suggest a diagnosis of emphysematous pyelonephritis. With advanced transaxial imaging, our ability to diagnose air in the urinary tract has increased. On comput erized tomography, some gas in the collecting system can be observed after instrumentation or among patients that have had a ureterosigmoidostomy urinary diversion, and this is not worrisome. 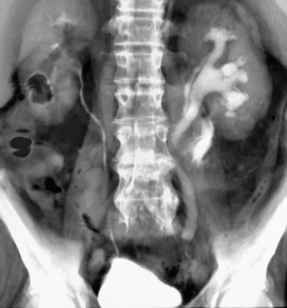 On the other hand, gas in the renal parenchyma on computerized tomography or gas in the collecting system on a less advanced imaging test (i.e., plain abdominal radiograph) can represent the more serious problem of emphysematous pyelonephritis. It is important to correlate finding of gas in the collecting system to other clinical findings for the patient. In some instances, pelvic phlebo-liths may cloud the accurate diagnosis of upper urinary tract obstruction. A soft-tissue rim sign (i.e., soft tissue ring around the calcification) favors the diagnosis of stone on noncontrast CT (Colistro et al. 2002). Upper tract obstruction related to UPJ obstruction can often show associated hydronephrosis on noncontrast CT. Clues to a diagnosis of upper tract obstruction related to a retroperitoneal process (e.g., retroperitoneal fibro-sis, adenopathy, primary retroperitoneal malignancy, metastatic retroperitoneal malignancy, aneurysm, etc.) are also initially deciphered or frequently diagnosed on noncontrast CT.
of cases, ureteral tumors were observed on standard ur-ographic or cross-sectional imaging as ureteral filling defects or as irregular narrowed segments ofthe ureteral lumen, respectively (Kawashima et al. 2004).